We provide a listening service from the branch 24 hours every day of the year. We train and support Listeners in both Bristol (male) and Eastwood Park (female) prisons. For callers with wheelchairs there is a lift in the front lobby which volunteers will assist with when required. From our branch in the centre of Bristol we provide confidential emotional support to those in need of a safe space to talk over problems, feelings, stress or anything that maybe worrying them, especially those in extreme despair. During 2018 our 145 trained volunteers responded to over 40,000 contacts for support by phone, email, text and face to face visits in our branch. I should say that 80% of our calls do not express suicidal thoughts, but just need a space to talk. We also provide talks for community groups, schools and other organisations interested in our work. We have partnerships with a number of local organisations, including local health services, HM Prison Bristol, HM Prison Eastwood Park and CRUSE. If you would like to know more about joining us as a volunteer please come to one of our Information Evenings. These will be held in the branch at 37 St Nicholas Street, Bristol, BS1 1TP on the first Monday of every month during 2019 (including Bank Holidays) starting at 7.15 pm and finishing no later than 9.00 pm. There's no need to book, just come along, and we will explain about becoming a volunteer with Samaritans and answer any questions you may have. Bernie (Director - Bristol Samaritans). Bristol Samaritans, a charity registered in England (1168123). 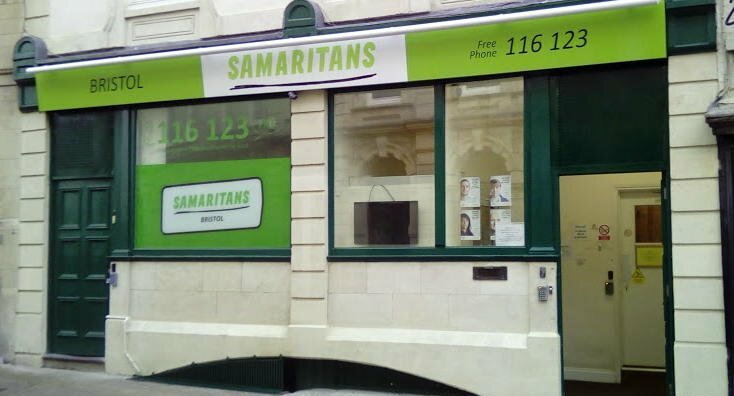 Bristol Samaritans is a recognised branch of Samaritans.